The ultimate fall themed low maintenance dessert – vegan pumpkin cheesecake bars that are also gluten-free and refined sugar free. With a walnut, date and apricot crust these are bound to be your new favorite sweet. After so many years of avoiding pumpkin as you can tell I am now seriously a die hard fan and need pumpkin themed everything in my life all fall and perhaps winter long. I’m even ready and eagerly testing out pumpkin themed dessert recipes. I started with a mildly sweet pumpkin granola mix which was an ultimate hit and then I saw Miryam’s no bake pumpkin cheesecake and knew I needed to make this ASAP. I mean not only is this a pumpkin themed dessert that doesn’t even require preheating the oven but it also happens to be vegan, gluten-free and refined sugar free as well. How many things can you honestly say that about? Oh and it’s still amazingly incredibly delicious. Like honestly. Pumpkins and cashews pureed together make a rich and creamy mix, definitely reminding you of a standard cream cheese loaded cheesecake but obviously way way healthier and still catering to all those with food and dietary restrictions. And then there’s the bottom layer of these pumpkin cheesecake bars. The crust of all crusts. Walnuts, apricots, dates, and just the tiniest hint of coconut milk to tie those three buddies together. Next time I’ll double the crust and just make little crust balls which will be a snack or afternoon treat in their own right. 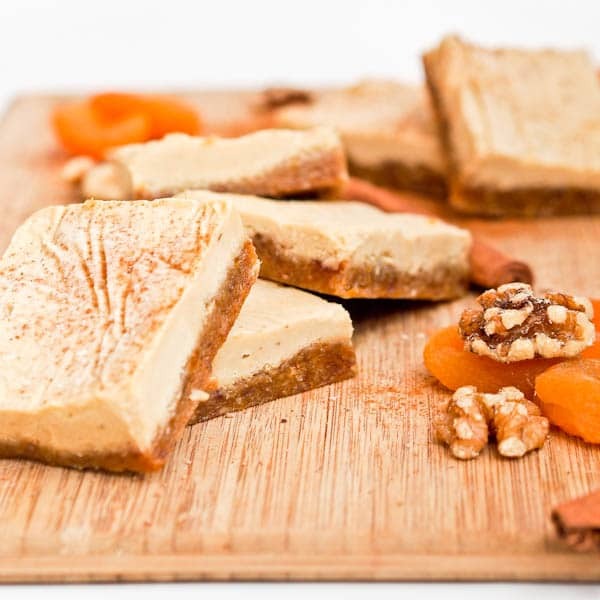 The key with this vegan pumpkin cheesecake bars recipe is to make sure the soaked cashews are perfectly pureed. You need them to be completely and utterly creamy. They can’t be gritty at all – it will ruin the entire texture and tasting experience. I tried making something similar before and having not blended the cashews long enough they were fairly creamy but you could still taste almond small sand crystals in the mix and it took away from the flavor of the dish. So many sure to use a heavy duty blender, or to move the mixture around with a spoon or fork to make sure that the cashews are being evenly dropped into that little crevice where the blender blade really chops it up into a creamy sauce. Without a heavy duty blender unfortunately these pumpkin cheesecake bars will not be the same, so please only attempt them in a heavy duty blender. The gritty texture of nuts can be hard to get rid of unless they are seriously properly pureed. Other than that this recipe comes together quickly and only requires a bit of freezing time before you can sample a taste. No baking required – amazing right?! 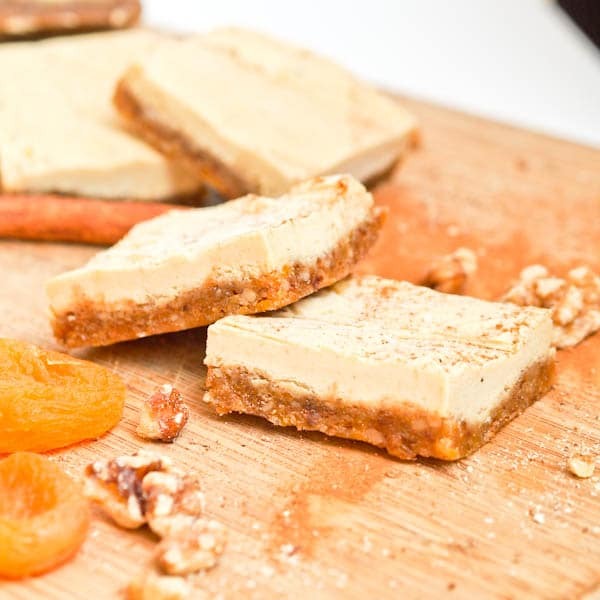 And these pumpkin cheesecake bars are practically healthy too! With an extra fresh sprinkling of grated cinnamon these vegan pumpkin cheesecake bars are the ultimate fall themed low maintenance dessert. Let me know what you think of these pumpkin cheesecake bars in the comments below! The ultimate fall themed low maintenance dessert - vegan pumpkin cheesecake squares that are also gluten-free and refined sugar free. With a walnut, date and apricot crust these are bound to be your new favorite sweet. In a food processor combine the ingredients for the bottom layer - the walnuts, dates, apricots, vanilla extract and coconut milk.Pulse until combined and smooth. Press the mixture evenly onto the bottom of a small baking dish. Freeze while preparing the top layer. For the top layer combine cashews, nutmeg, cinammon, pumpkin puree and cloves in a food processor or heavy duty blender and process until smooth. This might take a couple minutes. Pour mixture on top of the bottom layer and freeze for at least two hours. Store in freezer and serve lightly defrosted for a few minutes. Thanks so much! I loved this and never would have guessed it was a vegan, gluten free and refined sugar free dessert!